Photo right: The 2017 Clergy Leadership Conference was at St. Mark's UMC in Brandon, Mississippi, Feb. 6-8. Photo bottom right: Guest speaker, Rev.Dr. Graham Standish, addressed Mississippi United Methodist clergy. At the 2017 Clergy Leadership Conference, the Rev. Dr. N. Graham Standish -- pastor, spiritual director, and author -- taught attendees about "Leading a Church to Do and Discern God's Will." Graham, author of seven books including Becoming a Blessed Church and Humble Leadership: Being Radically Open to God's Guidance and Grace, said that while "the early church discerned, the modern church dissects, debates, and deliberates." He encouraged Mississippi pastors to help churches discern and follow God's calling to their congregation. 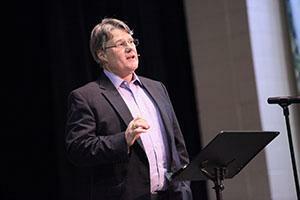 He offered instruction for how pastors can incorporate discernment into all areas of their ministry, especially worship preparation and committee meetings. Ann Phelps (Millsaps College) and James Martin (Wells UMC) led worship, including Tuesday night Evensong with the Millsaps Chamber Singers. Five break-out sessions empowered attendees to delve deeper into practices of leadership and discernment. This year's conference attendance was 178. 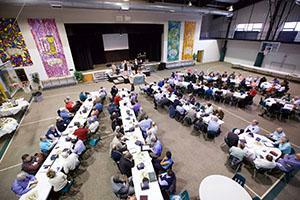 The conference was hosted by St. Mark's UMC and planned by the Center for Ministry. Click here to see pictures from the conference.